The University of Cape Town was founded in 1829 as the South African College, a high school for boys. In 1928, the university was able to move the bulk of its facilities to the magnificent site at Groote Schuur on the slopes of Devil’s Peak on land bequeathed to the nation by Cecil John Rhodes as the site for a national university, where it celebrated its centenary the following year. This unique group of buildings known as the Groote Schuur campus of the University of Cape Town, was built in the classical revival style and together with its open spaces constitutes the original campus as designed by architect JM Solomon in 1918. The building was restored by Herbert Baker in 1894, at which stage it formed the focal point of an avenue of trees running up the hillside from Rustenburg House and which, at the instigation of Cecil John Rhodes, was replanted with plumbago japonica, jacaranda and turkey oaks. A part of it, known as Japonica Walk, survives to the present day. The origin of the university can be traced back to the Stellenbosch Gymnasium, which was opened on 1 March 1866, which became the Stellenbosch College in 1881 and which was located at the current Arts Department. In 1887 this college was renamed Victoria College; when it acquired university status on 2 April 1918 it was renamed once again, to Stellenbosch University. The university campus is low-rise and a pleasure to walk or bike across, and is set in the heart of South Africa’s wine country. On 10 October 1930, an act of Parliament – championed by General Jan Smuts – gave rise to the name TUC becoming the University of Pretoria. At the time the University had more than 900 students, making it the largest tertiary institution in the country at the time. UP currently has more than 50 000 students and has become one of the leading higher education institutions on the continent. The university was founded in Kimberley in 1896 as the South African School of Mines. Eight years later, in 1904, the school was moved to Johannesburg and renamed the Transvaal Technical Institute. The school’s name changed yet again in 1906 to Transvaal University College. 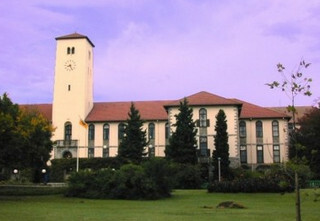 In 1908, a new campus of the Transvaal University College was established in Pretoria. The Johannesburg and Pretoria campuses separated on 17 May 1910, each becoming a separate institution. The Johannesburg campus was reincorporated as the South African School of Mines and Technology, while the Pretoria campus remained the Transvaal University College until 1930 when it became the University of Pretoria. In 1920, the school was renamed the University College, Johannesburg. Finally, on 1 March 1922, the University College, Johannesburg, was granted full university status after being incorporated as the University of the Witwatersrand. The Johannesburg municipality donated a site in Milner Park, north-west of Braamfontein, to the new institution as its campus and construction began the same year, on 4 October. Initially, the medium of instruction was English, but later this changed to be bilingual and included Afrikaans. The name was changed to the University College of the Orange Free State—the Afrikaans version of this name change is the source of the word used to this day to refer to students of the University (“Kovsies”). In the late 1940s, the medium of instruction was changed to Afrikaans. The University was declared a full-fledged, independent university in 1950, and the name was again changed to the University of the Orange Free State. It was founded in 1910 as the Natal University College in Pietermaritzburg, and expanded to include a campus in Durban in 1931. The Howard College campus in Durban was strung out along the Berea, a ridge to the north of the Durban city centre. Under apartheid, the Durban campus of the university was known for the activism of its staff and students against government-imposed racial segregation. In the 1970s and 1980s many of its students were members of the often-banned NUSAS (National Union South African Students), centred on the main arts centre at the Howard College campus. In addition, the university magazine Dome (named for the dome of Howard College), was active against apartheid and was often banned, with the printing press being moved around to prevent its being confiscated by police. In 1980 there was a brief boycotting of the food hall by the college residences because of the unfair treatment of black staff by the food supply contractor FEDICS. On 1 January 2004, the University of Natal was merged with the University of Durban-Westville to create a new legal entity called the University of KwaZulu-Natal. Rhodes University (RU or simply Rhodes) is a public research university located in Grahamstown in the Eastern Cape Province of South Africa, established in 1904. It is the province’s oldest university, and is one of the four universities in the province. It is the fifth or sixth oldest South African university in continuous operation, being preceded by the University of the Free State (1904), University of Witwatersrand(1896), Stellenbosch University (1866) and the University of Cape Town (1829). Rhodes was founded in 1904 as Rhodes University College, named after Cecil Rhodes, through a grant from the Rhodes Trust. It became a constituent college of the University of South Africa in 1918 before becoming an independent university in 1951. The university has an enrolment of over 7,000 students, approximately 3,000 of whom live on campus in several residences located on campus while the remaining students (known as oppidans) take residence in digs (off-campus residences) or in their own homes in town. Nelson Mandela Metropolitan University (NMMU) is a South African tertiary education institution with its main administration in the coastal city of Port Elizabeth. A merging of three institutions founded NMMU in January 2005 but its history dates back to 1882 with the foundation of the Port Elizabeth Art School. The University draws international students from all over the world. There are over 3000 international students and include students from the United States, France, China, Germany, Belgium, Denmark, Finland, Netherlands, Norway, Sweden, United Kingdom and many African countries. NMMU is a comprehensive university offering professional and vocational training. The University has six campuses – five in Port Elizabeth and one in George. The main campus is the South Campus. Students at NMMU can study towards diplomas and degrees up to and including doctorallevel qualifications. A number of courses include workplace experience as part of the curriculum. The University of the Western Cape is a public university located in the Bellville suburb of Cape Town, South Africa. It was established in 1960 by the South African government as a university for Coloured people only. Other universities near Cape Town are the University of Cape Town, (UCT, originally for English speaking whites) and the Stellenbosch University (originally for Afrikaans speaking whites). The establishing of UWC was a direct effect of the Extension of University Education Act, 1959. This law accomplished the segregation of higher education in South Africa. Coloured students were only allowed at a few non-white universities. In this period, other ‘ethnical’ universities, such as the University of Zululand and the University of the North, were founded as well. Since well before the end of apartheid in South Africa in 1994, it has been an integrated andmultiracial institution. The University of the Cape of Good Hope (UCGH) is established in 1873. The UCGH was incorporated into Unisa, and became the first examining university in 1918, in terms of education minister FS Malan’s university legislation. A ‘federal’ system linked other university colleges to Unisa, which was responsible for examinations nationally. Registrar William Thomson and four assistants established a tiny presence in downtown Pretoria. In 1919, Unisa issued 138 degrees to six colleges for candidates undergoing examination. The affiliated university colleges broke away between 1921-1952 to become the independent universities of the Witwatersrand, Pretoria, Natal, the Free State, Rhodes and Potchefstroom. Potchefstroom professor AJH van der Walt was hired in 1944 to look into correspondence education. He launched the Division of External Studies in 1946 amidst great controversy. Between 1947-1973 it operated from more than 10 buildings in Pretoria. The University of South Africa Act of 1959 gave Unisa the say over institutions that provided tuition to students that sat for Unisa examinations. Unisa shut down most correspondence colleges. In 1959 Unisa became the world’s first correspondence university, using study guides, cassette tapes and limited face-to-face tuition. Finally, fundraising began for the dramatic Muckleneuk Hill campus (pictured) in the mid-1960s. It was finally completed in a heroic Modernist style in the late 1980s.